For those who bought Whopper meals, Burger King and Microsoft gave away a Kinect every fifteen minutes in America until the motion sensor launched late last month. That's over 1,500 Kinects! In Japan, twenty Kinects will be given out. That low number isn't too surprising considering that there are only 36 Burger King restaurants in all of Japan. The catch here is that customers must order a BK Party Set that includes a Holiday Chicken Salad, BK Tenders, BK Cheese Bits, onion rings (mmm onion rings) and a NY Pizza Burger. The price of all this food? ¥2,980 or US$36. That's right, $36 to enter a draw for one of twenty Kinects. 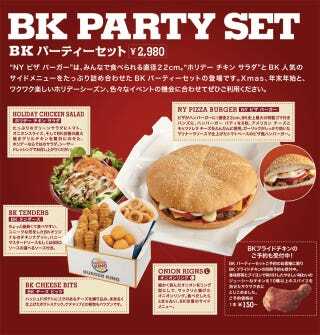 The BK Party Set must be ordered and is intended for holiday and end-of-year gatherings — not daily consumption! And winning a Kinect is likely to be an afterthought for most. Contest ends on December 19. Heartburn lasts much longer.